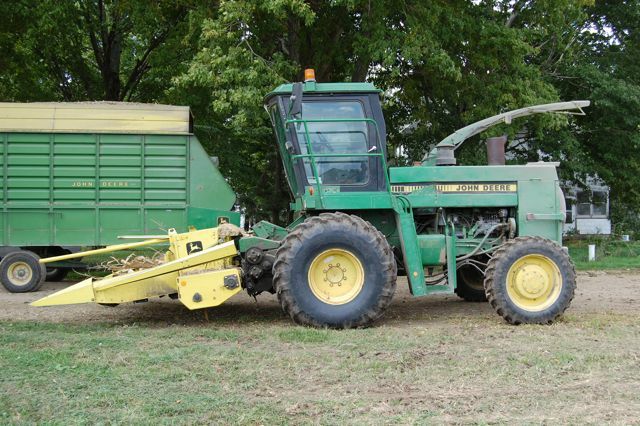 I admit, it does look a lot like a combine if you aren’t used to the two pieces of equipment. But you can tell a chopper by a couple of things. 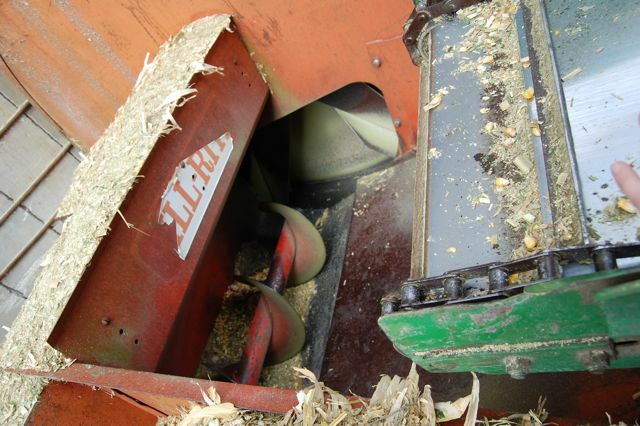 First off, there isn’t a big grain holding bin on the back, just the chute that spits out the chopped-up corn. Secondly, the chopper is a lot smaller. 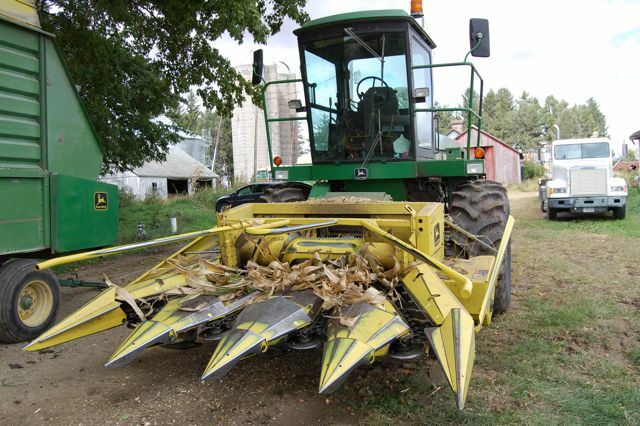 A combine would usually have a few more rows of teeth in the front and would be generally just bigger. Here’s a video of one in operation to give you an idea of what it looks like running. …which looks like this. 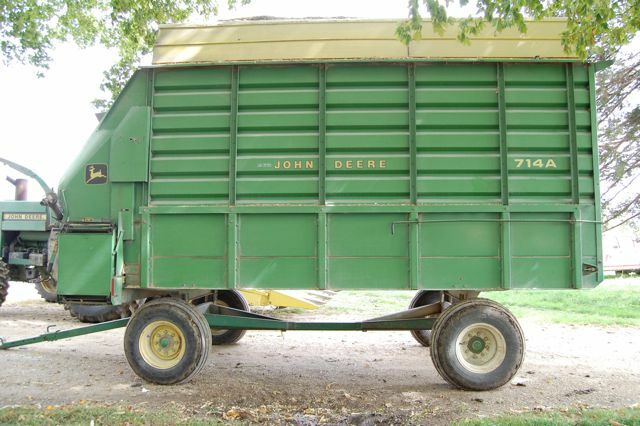 It is also different from a grain wagon in a few ways. 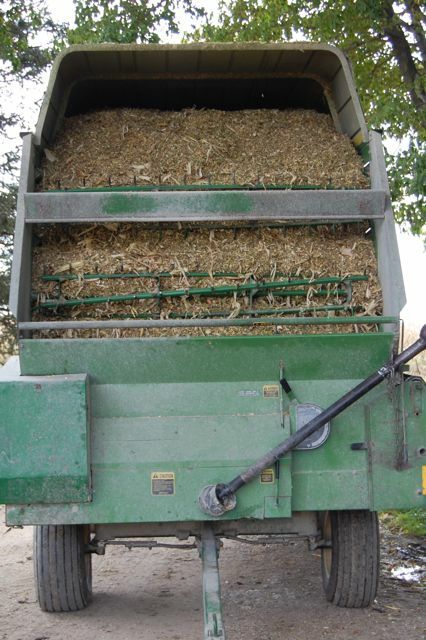 For starters, it has a lid to keep the chopped corn from blowing right out. 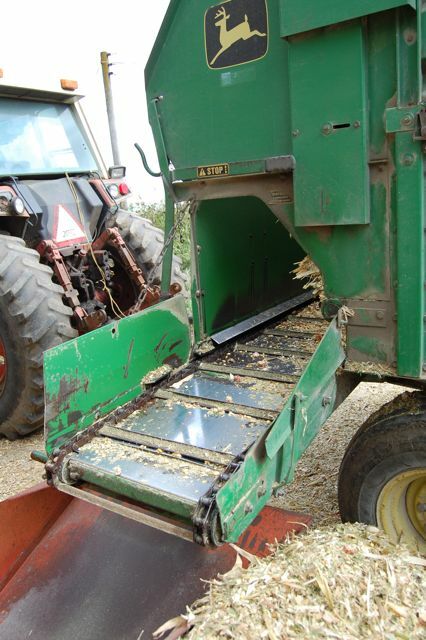 This wagon also has conveyers inside that help to move the chopped corn out. 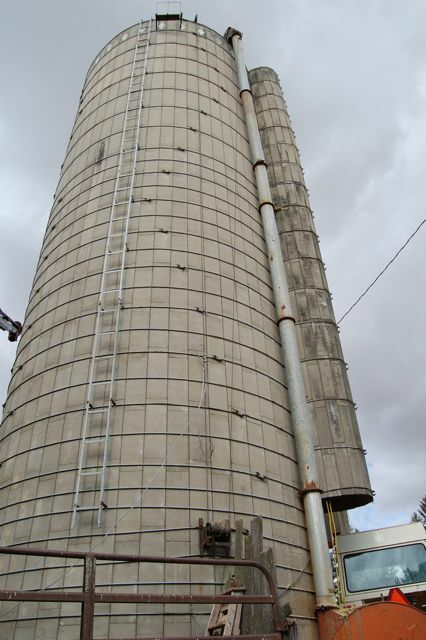 …all the way to the top and then over. 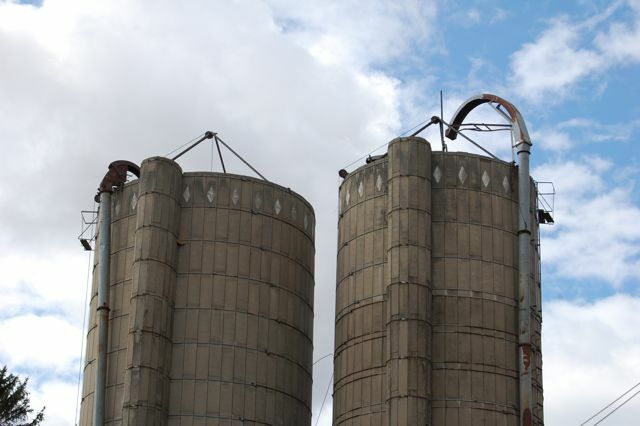 The silos are probably 5 stories tall, so it takes a lot corn to fill one. 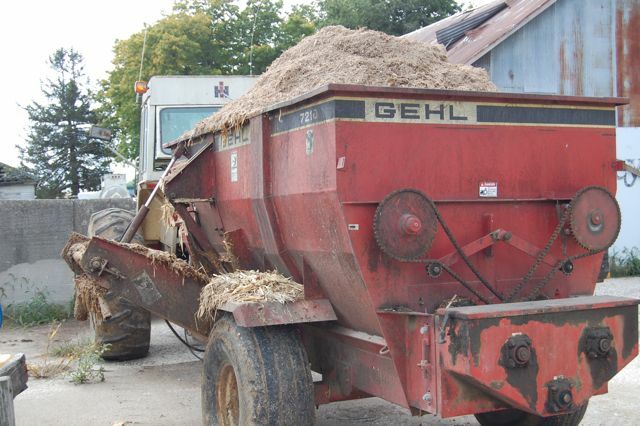 When it’s time to use the chopped corn, it gets dumped into one of these wagons and then it’s fed to cattle. I’ve been exceptionally careful to keep the dogs away from all the equipment as they are hard to see from the inside of a tractor. 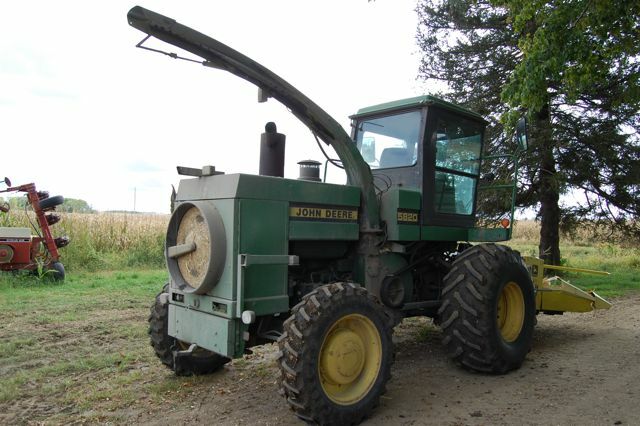 We’ve been going out when there are breaks or when I can see where all the tractors are so that we can avoid them. My three mutts don’t yet know how to behave on a farm, so I have to keep a pretty tight watch on them. The jet-lag seems to be slowly leaving us. Everybody slept until 7 this morning with no middle of the night wake-ups. Mal is slowly figuring out that he can’t whine his way through the window out into the yard with the cats. He still watches for them, but isn’t nearly as annoying. Malcolm and Micheal have played a few times in the house, though we still have to watch the two of them when there is food involved as Micheal will growl and snap. Overall, things are a little bit better today than they were yesterday. I’m a coughing a little less, the dogs and cats are a little more settled, I got a full-nights sleep, it’s all just a little more calm. Already working on the farm 🙂 THe farmers here would be harvesting the corn too if it wasn’t so darn wet!